Have you ever told your child to “pay attention” or “breathe” to calm down? Those are actually skills that one can develop with experience and practice. Mindfulness provides the foundation for these skills. Mindfulness means being fully aware in the present moment without judgment. It is knowing what is on your mind without automatically acting on it. From research, regular mindfulness practice can reduce stress and pain, increase awareness of one’s biases, generate compassion, and aid learning. Mindfulness skills are currently practiced in a variety of environments: athletics, police forces, schools, corporations, and during anti-bias work in a number of settings. In advance of launching Mindfulness in the Lower School, an exploratory group of faculty and staff met last year. The eight week Mindful Schools curriculum was piloted in Jessie’s third grade. Over the summer we developed a set of next steps: a mindful environment and teacher training. One way in which mindfulness was added to the Lower School environment was through the use of signs in teacher spaces that inspired mindfulness practice. In order to authentically teach mindfulness to students, a teacher must have their own experience and skills. Since September, faculty and staff have been practicing mindfulness weekly at the start of each faculty meeting and through the Mindful Moment that is included in the weekly staff notes. Bonnie Levine, a mindfulness instructor at Bank Street College of Education, provided further training for the faculty in October. She returned in December to share ways to teach mindfulness to children. Since December, faculty meetings still begin with mindfulness, but now teachers share a mindfulness practice they do with their students. In February, a weekly Mindfulness group for faculty and staff began to support growth in Mindfulness and provide a moment of calm and reflection in their busy days. Currently, the faculty is bringing Mindfulness into their classes in varied ways. Most classes include a Mindfulness practice as part of their daily morning meeting, such as deep breathing or focused listening to a chime. 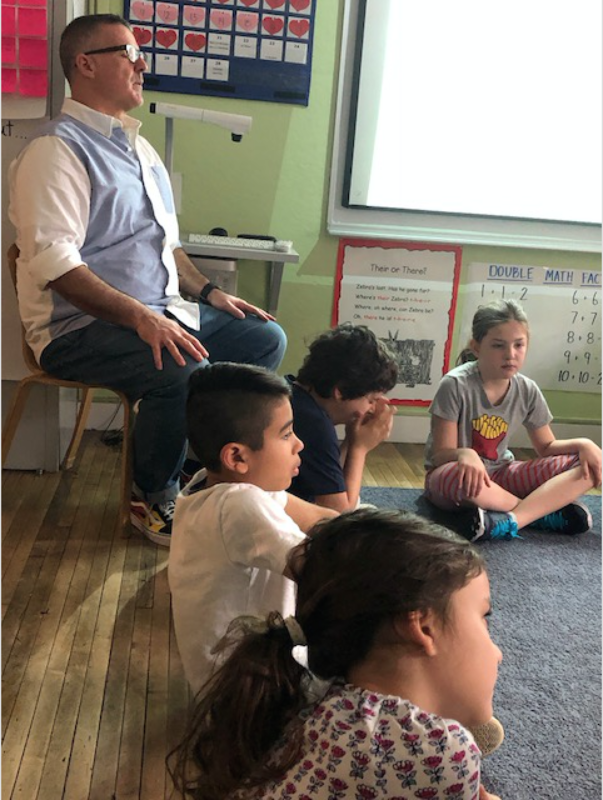 In Dan and Marcus’ Fourth Grade, the students lead a mindful moment, which occurs twice per day. In both second grades, various Mindfulness practices are used to help maintain attention or set a calm tone whenever needed. When students have difficulty paying attention or when they need a break from learning, there is a “Take a Break” chair in every class. 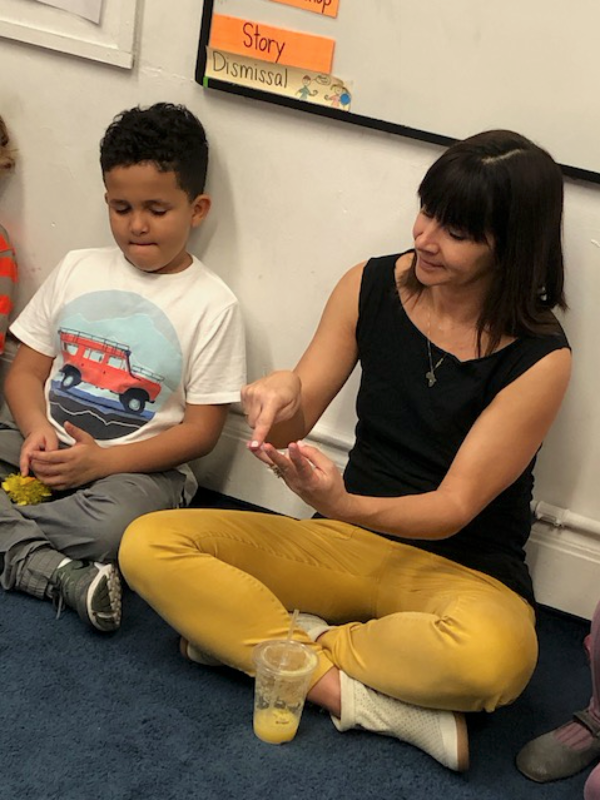 Many teachers include Mindfulness practices that foster self-regulation and reflection when children take a break.Some of the special area teachers also incorporate Mindfulness into their classes. For example, in music, Aedín pulls one card from a set of MIndfulness cards for children and leads the practice described with her students. Faculty and staff, who practice mindfulness regularly, report sleeping better and coping better with the everyday stresses of their lives. Students also reported improved sleep, as well as more concentration on their academic work and feeling calmer and happier. Some teachers noticed improved self-regulation in their classes after mindfulness practice. We will review our efforts with Mindfulness at the end of the school year in order to plan next steps in the Lower School. Please note that a handout of the Fostering Friendships presentation that took place earlier this month can be found in the downloads section of the Lower School page or by following this link. Please do not hesitate to reach out to Judy should you have any questions regarding the topic. is the feel-good musical comedy smash that will have us dancing in our seats! When disco diva, Deloris Van Cartier, witnesses a murder, she is put in protective custody in the one place the cops are sure she won't be a found: a convent! Her new environment and relationships change the course of the character's lives for the better. Sister Act is a sparkling tribute to the universal power of friendship, Come and let us uplift you and leave you ready to SPREAD THE LOVE! Bring the whole family, get ready to feel good! 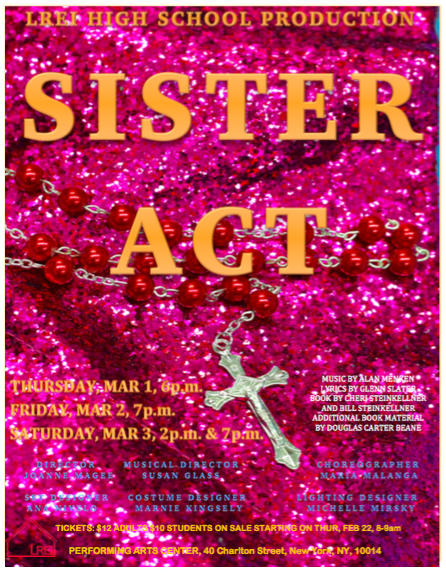 Thursday, March 1st at 6pm, Friday, March 2nd at 7pm and Saturday, 3rd March at 2pm and at 7pm. Tickets are on sale in both lobbies starting Feb 22nd 8am-9am. $10 students $12 adults.